Leading up to the latest Doctor Who Christmas special’s debut on December 25 at 9 p.m. EST on BBC America, the cable outlet will run a marathon of previous episodes and a new special focusing on the Christmas specials. BBC America will launch the festivities on Friday, December 23rd at 9 pm ET/PT. The network will be airing all of the recent Who Christmas specials, from “The Christmas Invasion” up through last year’s “A Christmas Carol.” Saturday night at 8pm ET/PT they’ll have the world premiere of the brand-new Doctor Who: Best of the Christmas Specials. The best-of show will feature celebrity Who fans from various industries discussing their favorite moments from the Christmas specials over the years. 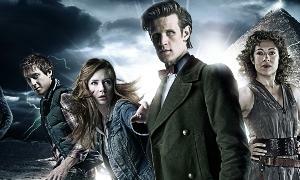 On Sunday, Christmas Day, they’ll launch into a marathon of all 13 episodes of the recently aired season six. The event will culminate with the airing of the new special, Sunday evening at 9 p.m. EST. Set your digital recording devices now!